Rising French star Céline Boutier took the clubhouse lead with a four-under-par 68 in the Australian Ladies Classic Bonville on Friday, which was the best round of the morning, sending an ominous sign for the field having recently won the Sanya Open in China in November. “I’m very satisfied with my day and I felt like I was hitting the ball pretty solid and I was giving myself birdie opportunities,” said the 24-year-old from Montrouge, who had an eagle at the seventh and six birdies in her round to be six-under through 36 holes. Iceland’s Valdis Thora Jonsdottir backed up her opening round with a solid 70, with just a single bogey among three birdies to sit in second on five-under. “I played quite solidly and I didn’t have a lot of trouble. I didn’t give myself as many birdie opportunities, but I made a couple of good putts for birdie and pars, so I’m happy,” she said, adding that the damp and humid conditions made it a bit tougher. “The air felt kind of heavy, so it was hard to estimate which club to use and I could tell that I was hitting it a bit shorter. Overall the conditions were good. Sweden’s Daniela Holmqvist (69) and Ines Lescudier of France (70) were both in the clubhouse on three-under to be well in contention heading into the weekend. 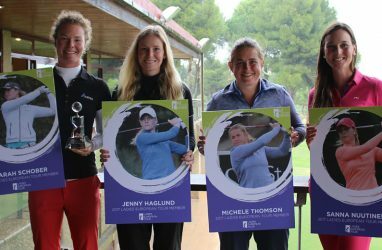 Finnish compatriots Noora Komulainen and Ursula Wikstrom had matching 69s to be at one-under alongside Katie Burnett of the United States and Sweden’s Jenny Haglund.